Afrezza scripts came in below 600. MannKind has debt to handle in Q2. MannKind (MNKD) shareholders were excited last week when scripts approached 700. 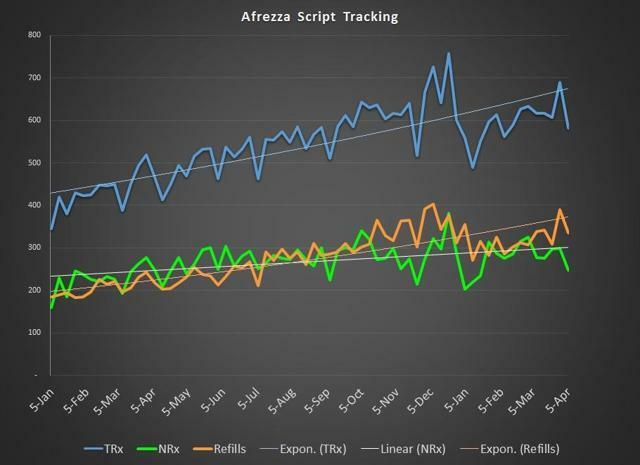 I stated at the time that the higher than expected script number was most likely an anomaly. This week the script print came in at 582, and I will repeat the same statement. This low number is also an anomaly. The realistic number was likely a bit over 630, but we have an action/reaction dynamic happening here. March 31st represented the end of a quarter. It makes sense that reps, etc., would want to post the best possible number. We saw the fruits of the labor with a print of just below 700. The reaction was to step back and coast a bit, which then delivers a follow-up of a low number. The issue here is that we cannot expect a sales force to give 200% effort every week. The issue here is that when operating in normal mode, the size of the sales force is just not capable of delivering the level of growth needed. The problem is that increasing the size of the sales force costs money that this company cannot really afford to spend. The television ad experiment of Q1 seems to have been just that - an experiment. It was yet another strategy which was implemented to try to drive growth to more acceptable levels. Investors have seen a contract sales force, a direct hire sales force, regional shake-ups, training sessions and re-training sessions, the sponsorship of a reality show with Charles Mattocks, a venture with Dame Dash, larger sales force with minimal ads, a smaller sales force with a lot of ads, a label change, a small clinical trial hyped to be bigger than it was, voucher programs, rebate programs, hockey sponsorship, IndyCar sponsorship, direct to consumer programs, and on and on. Thus far, every move made by MannKind in its effort to deliver the necessary numbers has fallen short. MannKind has had full control of Afrezza for 11 quarters. In a few weeks, MannKind will have had Afrezza in its hands for twice as long as Sanofi (NASDAQ:SNY) did (and 6 months of the Sanofi effort was after it decided to give up on Afrezza). What we have seen are a number of initiatives which excite perma-bull investors for a short period of time, but never seem to deliver the needed growth. In fairness, it is my belief that the retail numbers are being impacted by the direct selling effort of MannKind. That direct selling effort saw a 25% increase in price beginning with Q2, but even with that increase, the revenues per script generated are much more modest than what is seen at retail. The new program makes Afrezza available for as little as $5 per day. In order to get that price, a user must limit themselves to 3 doses per day, which seems contrary to the way most users dose the drug. Even with a 25% increase in direct selling price, the impact of the program on the bottom line may not be what some expect to see. The second quarter of 2019 will have some interesting dynamics. There is a $2.5 million payment due to Deerfield in May, a $2.2 million payment to Amphastar in June, and interest due on the 9.75% note. Just after Q2 closes, the company has two Deerfield payments totaling almost $9 million and another interest payment of $1 million. 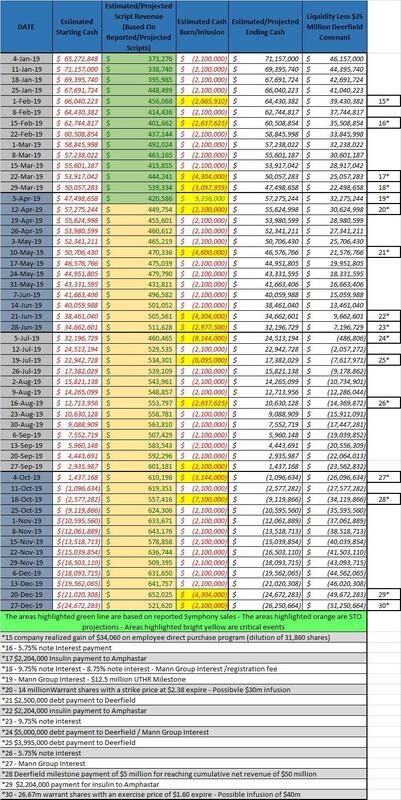 By my current projections, MannKind will start off Q2 with $57 million and finish with $32 million. That is not the end of the world, but with almost $10 million in payments due over the subsequent 3 weeks, you can see the cash crunch once again taking center stage. In my opinion, the time for MannKind to act on its cash situation is in Q2. A likely move is using the 14 million shares which were tied to warrants but are now unencumbered to pay Deerfield. The issue at hand is whether or not there will be any news to assist in driving up the price per share so that the Deerfield matter can be handled with fewer shares. The quarter-over-quarter numbers are starting off in a less than thrilling manner. Week one of the second quarter is just 4% better than week one of the first quarter. Is it growth? Yes. That being said, the first week of Q1 included a major holiday. The quarter-over-quarter revenue is up by a bit over 12%, which is a bit more positive. 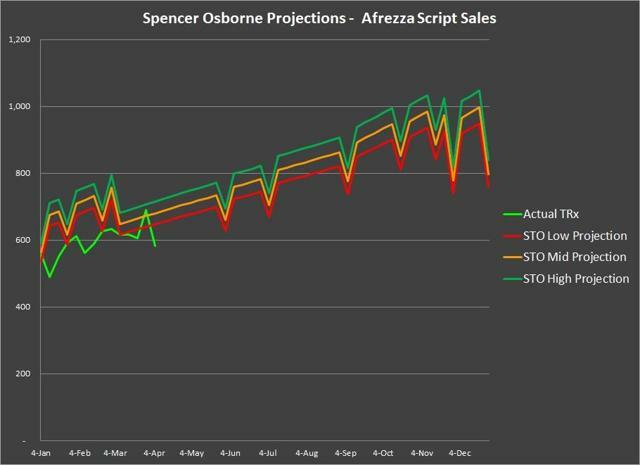 Once again, with an anomaly in the big dip this past week, the scripts are tracking below my projections. Readers should bear in mind that my projections do not yet include the direct selling sales. I have seen some analysts stating that the Symphony numbers only give "half of the numbers". I caution readers to not take such statements literally. While the Symphony tracked data covers half of the channels, the direct channel does not deliver half of the revenue. A realistic projection for the direct channel in Q1 is revenue of a few hundred thousand. The cash situation at MannKind is pretty much as usual. I estimate that the company has about $55 million in cash with some big ticket items on deck to be paid. I suspect these debt items will likely be handled in shares in order to preserve cash. The cash runway runs until about the end of Q3 if these debt items are paid in cash, and until the beginning of November if they handle the debt in shares. The next set of warrants expire in lat December and are priced at $1.60. The issue is whether or not MannKind can afford to cut it close. There is a reason aside from not delivering traction as to why you see television ads turned off. The company needs the cash. The lack of cash hampers pipeline development as well. Subsequent to this being written, but prior to submission for publication, MannKind issued a Tweet about script numbers. Here is the problem. MannKind has very recently stated that the Symphony numbers were accurate. They did so in the latest conference call, and again in a recent presentation. The company did not balk when we saw an anomaly last week with a pop in the numbers, but jumped to throw Symphony under the bus this week. What is troubling about this is that management seems desperate to placate retail shareholders that are overreactive. In doing so, management makes itself look like Bush League players instead of Major League players. MannKind has made these rookie moves in the past to move the goalposts. At the end of 2017, the company used some IMS data to give more favorable numbers. Two quarters later, the same IMS data forced them to issue a $300,000 downward correction to Q2 numbers. Does management want to pay the sales reps based on IMS data? Or will Symphony suffice to accomplish that because in that case a lower number is sufficient? The bottom line is that management should not cherry pick data, and should not get into the weeds after it has said that it won't. The bottom line is simple. Whether you use IMS data, Symphony data, or MannKind data, they all fall well short of demonstrating the level of growth that we need to see. When Q1 net revenue comes in at just $6 million or less, will IMS or Symphony matter? Nope. What will matter is that the growth level is not high enough to impress anyone. MannKind remains at the advantage of active traders. Less sophisticated investors had a belief that the $2.38 warrants would be exercised when it was clear that they would not. Less sophisticated players have lofty $40 price targets on this equity in the next 3 to 12 months. Some claim to have a "thesis", but that thesis is nowhere to be found. Vague words are not a thesis, nor is simply saying what people want to hear. As an investor, you owe it to yourself to dismiss the nonsensical, and assess what is realistic. Model the sales, the inflows, and the outflows. Hold yourself accountable to your model. Ask those that speak in vague terms to put some meat and potatoes in their assessments. If they refuse, then apply several levels of doubt to what they say. Current trading range is $1.60 to about $2.10. Stay Tuned!